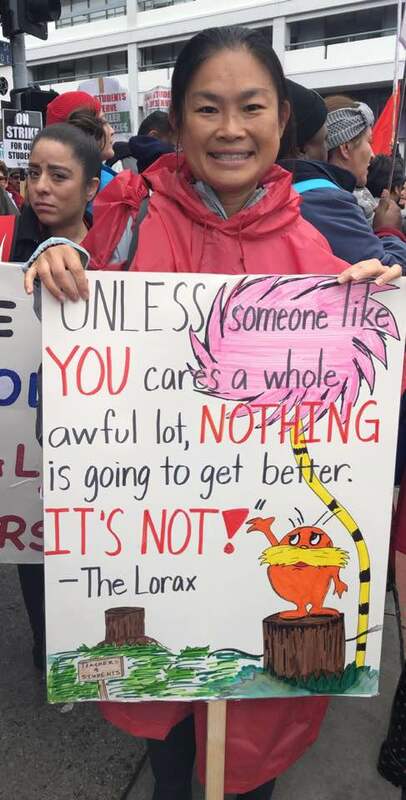 Teachers and their supporters have been busy this week—picketing, rallying, chanting, dancing, and singing for better pay, smaller class sizes, more counselors and nurses, and fewer charter schools. Despite the rain, morning picketing at the schools was followed again by big rallies yesterday, marking the third consecutive day of mass protest. Monday and Tuesday saw big citywide rallies; on Wednesday, teachers fanned out for six area rallies across the city. Four Labor Notes staffers are on the ground helping out with the strike. Here’s a little taste of what they've seen and heard over the last three days. “If you see any of the aerial pictures, we’re pretty much shutting downtown L.A. for the teachers, for the students, for our communities. It’s pretty much jaw-dropping and we’re doing it in a downpour and there’s still 50,000 people out there for our students,” said Franklin High School teacher Mark Ramos. English teacher Kimba Barney, who teaches 9th and 10th graders, said she wasn’t given a projector and had to buy one herself. 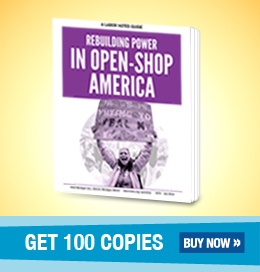 “We’re coming out of our own pocket to supply these schools,” she said. Some students are still attending school during the strike, but most aren’t. On day one, half the students reportedly showed up at University High, and they left early. Far fewer showed up the next day. The report from Westchester High on Tuesday was that only 40 out of 900 students were in attendance. All were being put in computer labs to do online work. At other schools we heard students were just watching movies, and miserable. Overall, even the school district reported as of Tuesday that only one-third of students were in school. And strikers were skeptical of those numbers—one mom at Dorsey High said her son had been marked present when he was actually outside picketing! So far, an overwhelming majority of teachers are showing up to picket duty every day. Very few have crossed the lines. 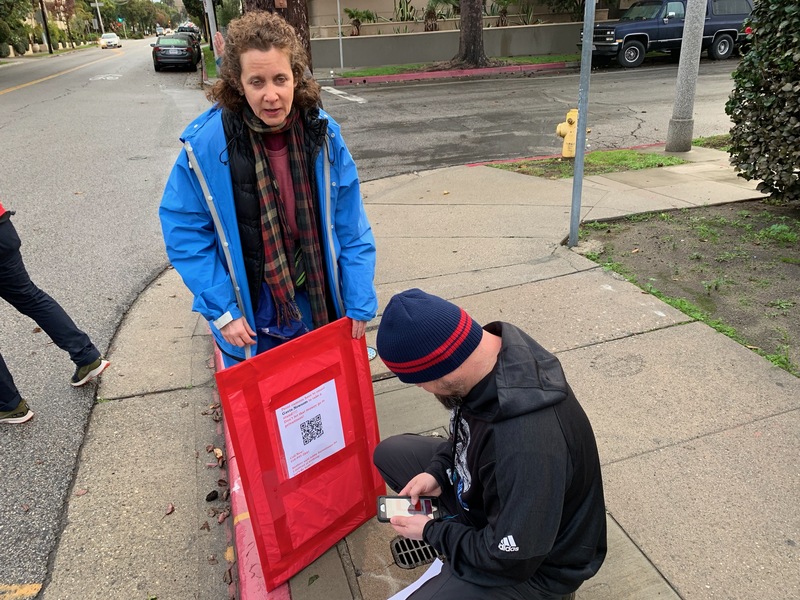 Tascha Folsoi, a librarian at University High who has taught in the district since 1999, created a poster with a QR code that she is using to get parents to send messages to California Governor Gavin Newsom. 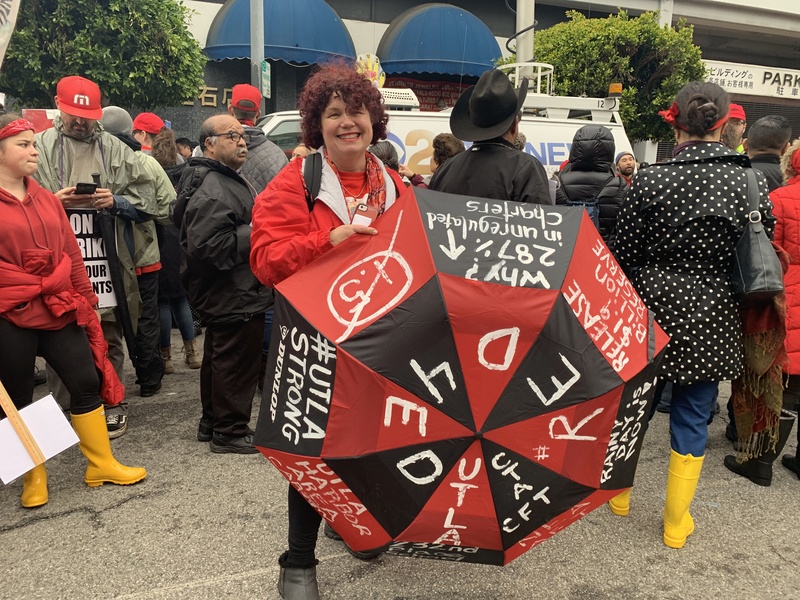 Undaunted by the rain, 25-year first grade teacher Stacey Michaels of 232nd Place Elementary School in Carson decorated an umbrella instead of a picket sign. Some teachers beat the rain by laminating their picket signs. Would you stand up and walk out with me? 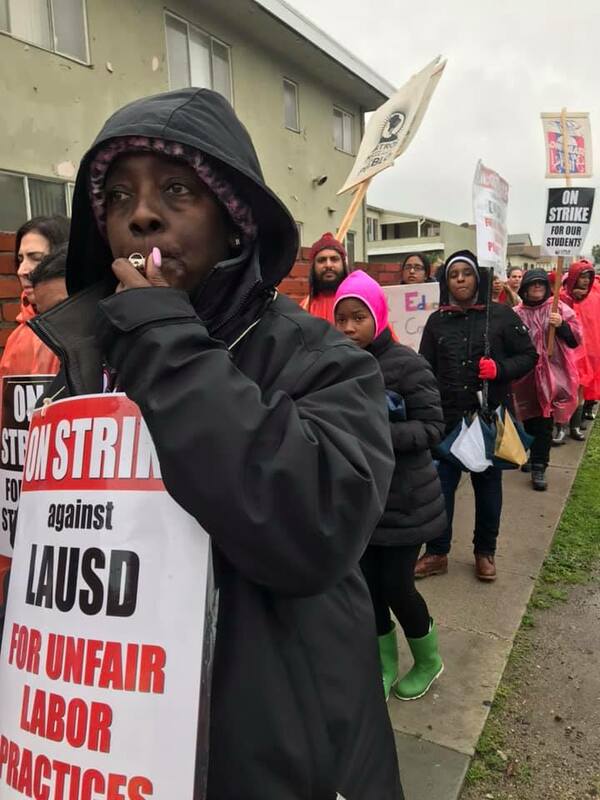 Labor Notes staffers Chris Brooks, Bianca Cunningham, Barbara Madeloni, and Samantha Winslow are in Los Angeles helping out with the strike and contributed reporting to this article.